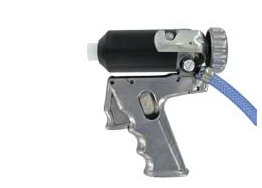 A high quality pneumatic cartridge gun with aluminium slotted bayonet retainer and pistol grip. 2.5oz size (75cc approx). Suited to controlled lines or potting of most adhesives, fluids, sealants, RTV, grease, gels, long cure or single part epoxies, mastics and potting compounds. Connect an air line to the applicator with a 1/4 Inch NPT threaded fitting to the male thread or use optional 1000-12 hose. 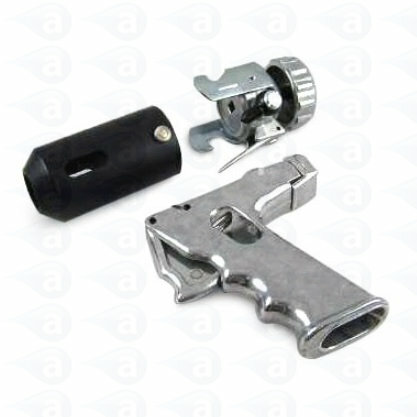 Our series of aluminium retainers will work with this gun series. Guns supplied with airline connector ready for hose. Twist off the retainer body from the handle on the gun (threaded fitting). Load in a 2.5oz (75cc) plastic dispensing cartridge. Attach a threaded nozzle or use a male luer lock adapter for attachment of any standard needle tips. Press trigger for flow. Release of trigger instantly stops material oozing.